Today, we’ve curated deals on soundbars across various price ranges on Amazon. The list contains products from brands like JBL, Sony, Philips and more. The Sony HT-RT3 Soundbar comes with five speakers and a subwoofer that delivers a total output of 600W. Users can stream music via Bluetooth and it comes with NFC as well. The device has one HDMI port, one USB port and one optical input for TV’s that are not compatible with HDMI. You can purchase this device here. The Philips HTL Bluetooth Soundbar offers virtual surround sound with 5.1 channel speakers. Music can be streamed via Bluetooth, AUX cable, and pen drives. It also comes with a built-in FM for an enhanced listening experience. You can purchase this device here. The JBL SB250 is a wireless soundbar that features a subwoofer. The soundbar connects to TV via analog or optical cable and can be controlled through your existing TV remote. Moreover, It offers Dolby digital surround sound with a total output of 200W. You can purchase this device here. 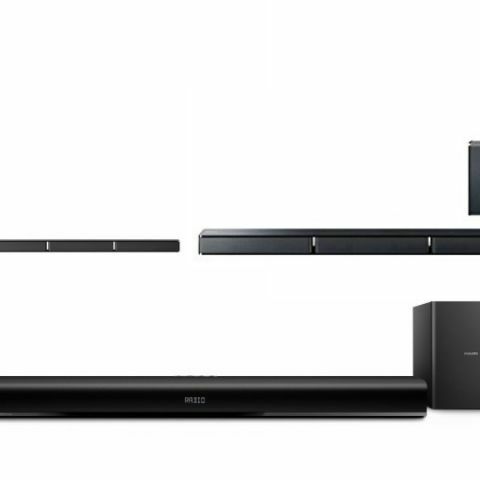 The Sony HT-RT40 Home Theatre comes with a three channel soundbar, two tall-boy rear speakers with one subwoofer. It offers wireless streaming via Bluetooth and NFC. It generates a total output of a maximum of 600W. You can purchase this device here. The Philips HTL 1032 is available with a pretty hefty discount today. The soundbar offers wireless music streaming, built-in FM, and a subwoofer as well. The audio playback can also be done via USB devices such as pen drive. You can purchase this device here. The Philips DSP-475U connects to TVs via a USB cable and also features a 3.5mm audio jack for music streaming via external devices like smartphones. The soundbar comes with a 5.25-inch subwoofer that is capable of producing a total output of 300W. You can purchase this device here. The Toshiba TY-SBX1000 is a single bar, which comes with an inbuilt subwoofer. It is a wireless device that can be controlled through the TV remote. The soundbar connects to TV via an HDMI cable and can stream music from your external devices via Bluetooth. You can purchase this device here. If the motive of purchasing a soundbar is simply to stream music via PC or smartphone, then the F&D E200 Plus is a perfect device to go with. It is a wireless soundbar, which comes with a 2.1 channel and 2600mAh battery that can be charged via micro USB cable. It also has a 3.5mm audio jack for music playback via an AUX cable. You can purchase this device here.